Our Chaplaincy is part of the Diocese in Europe (a diocese of the Church of England) and a member of the Anglican Communion. The Chaplaincy has been serving the Algarve since 1963: you can read something of our history on the About the Chaplaincy page. More importantly, we are a diverse group of people united in seeking to follow Christ. Thank you for visiting our site. Please have a good click around our pages, we hope you find the information you need. Some members spend all year in the Algarve, some come and go, and people on holiday often join us for worship and fellowship. We serve the whole of the Algarve from west to east, so whether you would like to know more about our worship and the life of our church community, or to request a home communion, or to arrange a baptism, wedding or funeral, please do contact us. Click here for maps and directions to our places of worship and regular service times. Monthly Newsletters with details of any variations in service times for festivals (and other reasons!) can be found via the News and Events pages: for Western Algarve here and for Central and Eastern here. Keep up to date with all that's happening in the Chaplaincy using our Facebook page (right). Please like our page and share your news and thoughts with the community. 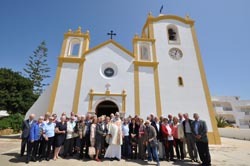 St Luke's is the only consecrated Anglican church building in the Algarve, located 6km east of Loulé. A popular location for wedding blessings, St Luke's is in the heart of the countryside. Regular service: Eucharist on Sundays at 11.30am. The church at Praia da Luz (just west of Lagos) is very near the beach. For regulars, the beautiful centre of the church community, for others an island of peace in the family holiday! Regular services: Eucharist on Sundays at 8.30am and 11.30am and Thursdays at 10am. 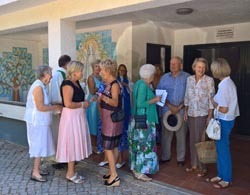 The congregation here meets at Pereiras, which is between Almancil and Vilamoura, just off the N125. A friendly bunch, they often welcome golfers in search of solace! Regular services: Eucharist on Sundays at 9.30am. 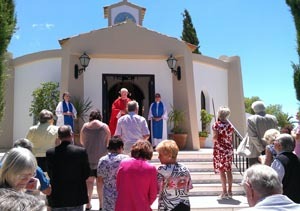 Worship at Praia da Luz and Pereiras is by kind permission of the Catholic Bishop of Faro. More information about our locations can be found here. 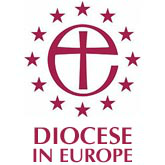 We are part of the Diocese in Europe. You can read the diocesan magazine The European Anglican here. Don't be shy . . .
Come and join us! Please do get in touch, whether you want information about worship, or weddings, baptisms or funerals, our contact details are here. We've all been there. At some point in life, everyone has a time when something has made us stop and think about meaning, about spirituality, about the existence of God. We certainly haven't found all the answers, but we are on a journey! We welcome the sceptical and the searching to join us as we explore the Christian faith further. We have short study courses in the spring and autumn, details will appear on this site.